The Colibri Evaluation Board already has buttons and LEDs available for debugging purposes, therefore only jumper wires are required. To find out which GPIO number to use in the Linux sysfs interface, you have to know the correspondence between available pins in the carrier board, number of the correspondent pins on the SODIMM connector of the Colibri computer on module and number of the pins on Linux. Warning: The pinout of the Camera Interface connector (X22) has been updated from Colibri Evaluation Board V3.1 to V3.2. Please consult the datasheet if you are using the older version. 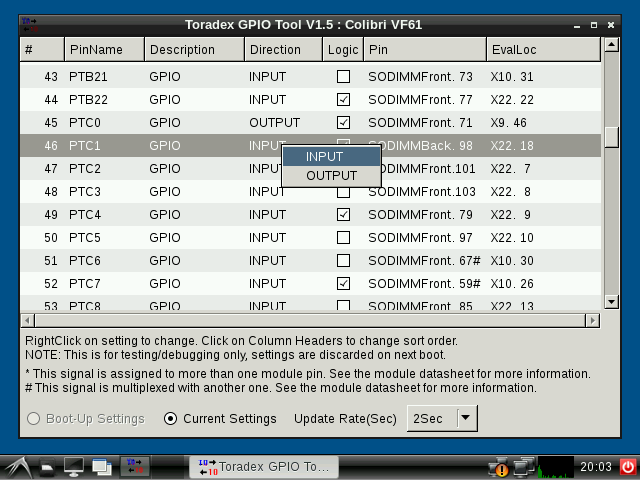 Have a look at the table available in the "List Functions" chapter of the Colibri VFxx datasheet. 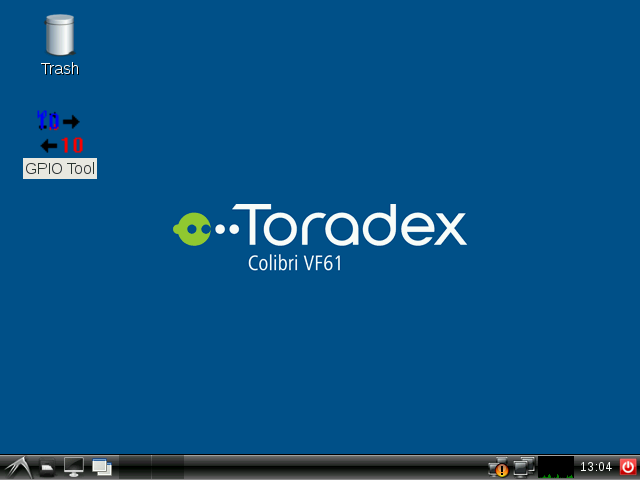 It provides a list of most of the Vybrid pins available on the SODIMM connector. The SODIMM pins we are interested at are connected to the Vybrid SoC and have names defined by the ALT0 function. 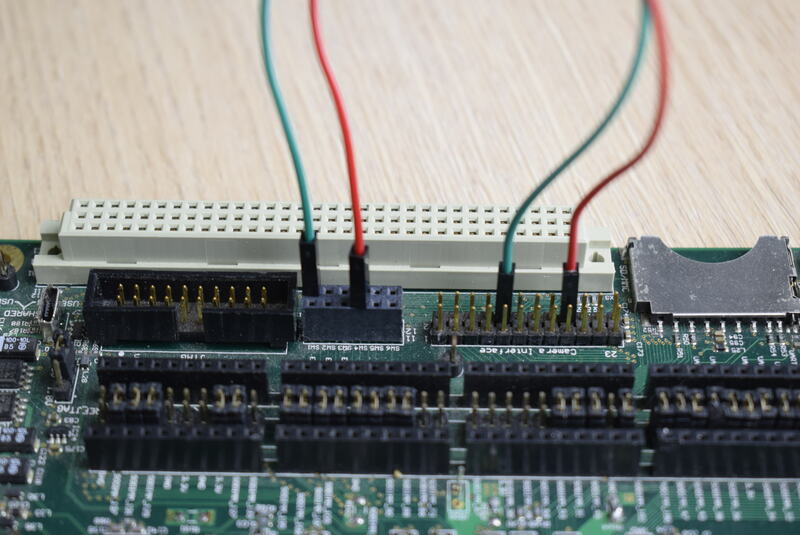 Each pin is multiplexed to have a specific function - among them GPIO, therefore the GPIO pad, GPIO port and ALT0 functions are the columns that we are interested at. Use jumper wires to connect GPIO 46 to the slide switch SW4 on the connector X21.7, and GPIO 50 to the LED1 on the connector X21.2. Note: For more informations about pins schematic, please access the Colibri Evaluation Board schematics here. Note: You may use any other of the LEDs/switches available. Please refer to the section 3.9.2.3 LED / Switches (X21) of the Colibri Evaluation Board datasheet. Locate the pins 46 and 50 in the table. Right click the direction of each of them and configure pin 46 as INPUT and pin 50 as OUTPUT. See the changes reflected in the application. Toggle the switch SW4 and see the Logic checkbox of the pin 46 change its state. Click the Logic checkbox of pin 50 and see the LED switch on/off. See that the pins 46 and 50, configured as input and output in the previous steps, are the only ones taken by sysfs and are correctly configured as in and out respectively. Additionally, a GPIO can be used as an interrupt source to wake-up the system from a low-power state. The SODIMM 45 is defined as the wake-up pin by default. The behavior is not well defined for every module, depending on the provided BSP. 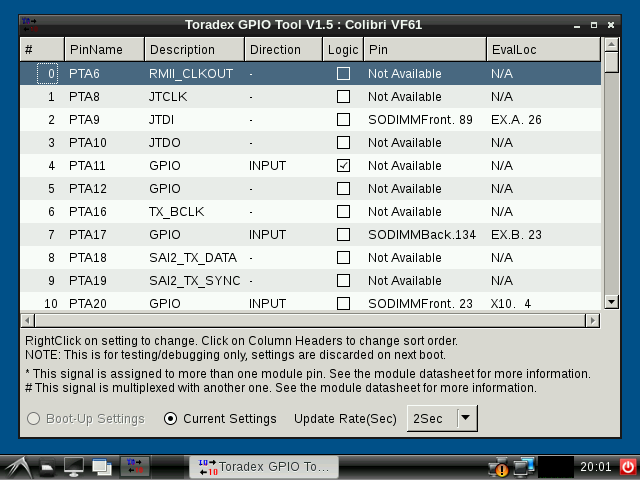 If this knowledge is really required, you might verify the kernel GPIO/pinctrl subsystem. See this patch added to the Vybrid family BSP for more details.